2015 Road Trip Photos #7: Spirits of the Revolution « Midlife Crisis Crossover! 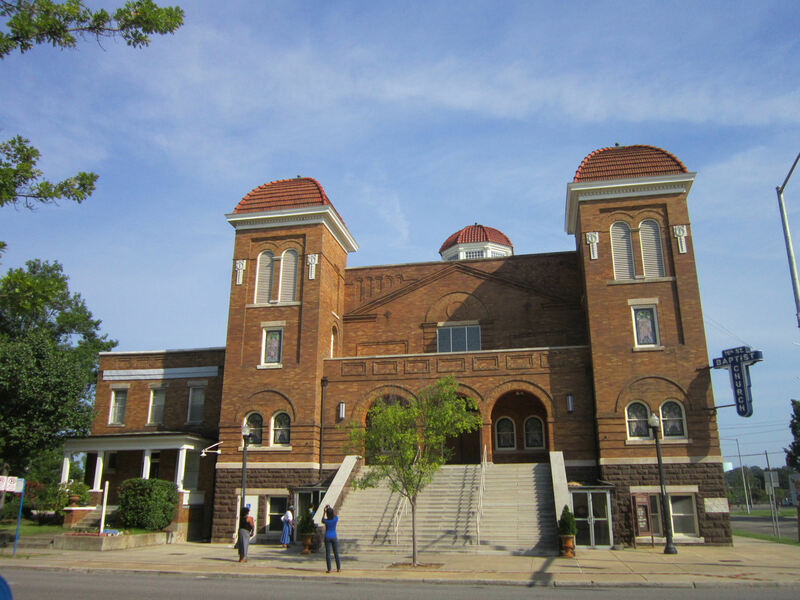 The church dates back to 1873, when it began, as many others do, as a cluster of Christians seeking shelter, communion, and community wherever they might find it. The first house they could call their own was built in 1880, but condemned a relatively short time later in 1908. Within a year construction had begun on the edifice that stands there to this day. Many of the original materials remain where they were first laid. But not all of them. In the wake of the explosion, a large chunk of wall was demolished and all but one of the church’s windows were left shattered. Other buildings were damaged for blocks around. 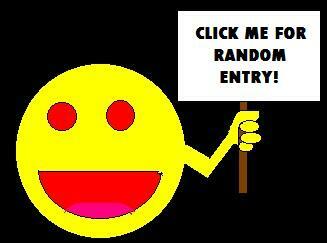 Thousands convened on the scene to lend whatever aid they could. An outpouring of fundraising love flowed in from hearts across multiple nations. The church reopened for services after nine months of reconstruction, and remains in service to an active, healthy congregation today. Replacing the brick and mortar was the easy part. After two years of investigation, four suspects were fingered for this monstrous affront to humanity, all of them allegedly members of a fringe group who thought the KKK had gone soft and that the proper response to civil rights progress was down-home white terrorism. The FBI took over the investigation, refused to make a single relevant arrest despite any and all evidence, then shut it all down in 1968 as if their work was done and everyone should please disperse and never speak of this again. If you’ve seen Selma, you won’t be surprised to hear the man regarded as responsible for this gross obstruction of justice has a name that rhymes with May Medgar Moover. In 1971 Alabama Attorney General William Baxley reopened the case, did tremendous legwork, and six years later secured the conviction of one of those four men, who denied any direct responsibility up until his death during his sentence in 1985. A second suspect died from cancer in 1994 without ever being formally accused. Not until the year 2000, when a new FBI regime started their investigation over from scratch, were the other two men brought to trial. Both were summarily convicted. One died from cancer in 2004; as of this writing, the other remains live in prison. In the course of his trial and in numerous conversations for the rest of his life, the first man had named a fifth man of interest who he insisted played a much more central role in the bombing. 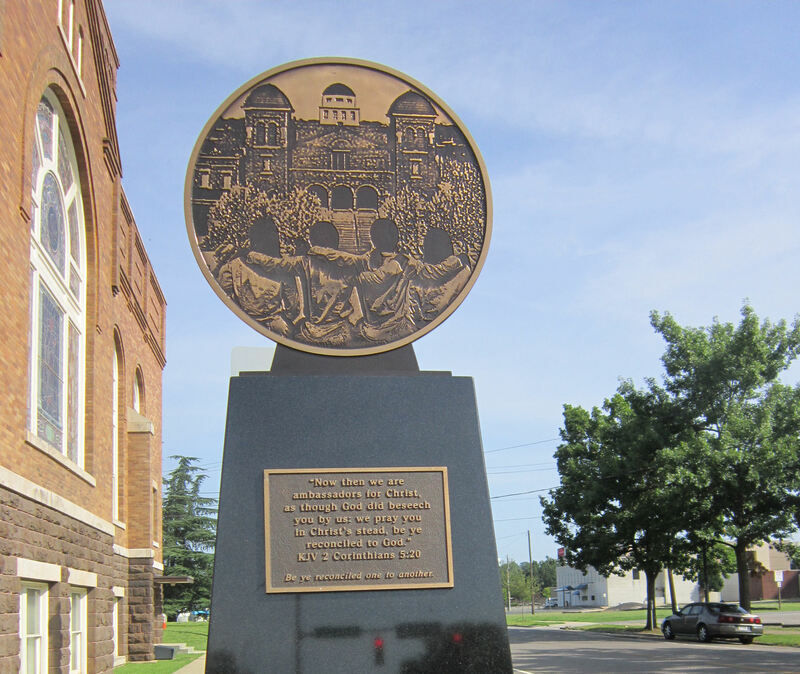 By 1965 that fifth man had become an FBI informant whose undercover testimony helped put away three other racists responsible for the death of a white civil rights organizer named Viola Liuzzo. He was rumored to have been the kind of FBI informant who really threw himself into his assigned role, and may not have been faking some of the acts of racist violence he was committing for the sake of his quote-unquote “cover”. He was eventually cleared of all charges related to the bombing, and saw his ghost-written autobiography published in 1976. He died in 1998 and was buried beneath a tombstone bearing his 1965 undercover street name. Selma remembers Viola Liuzzo with a moment on screen during the marches that she participated in, and, as I recall, includes her in the “Whatever Happened To” montage at the end, along with several other real-life demonstrators galvanized by what happened on Sixteenth Street — to the church, to the congregation, and to the four little girls who died in the explosion. 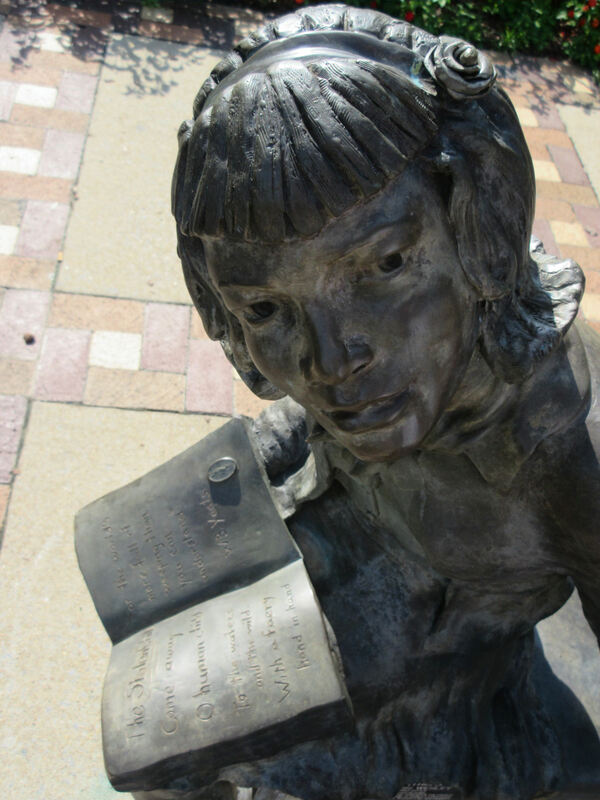 In September 2013, for the fiftieth anniversary of the bombing, “Four Spirits” was installed at the northwest corner of Ingram Park, right across the way from the church where members can see it and vice versa. 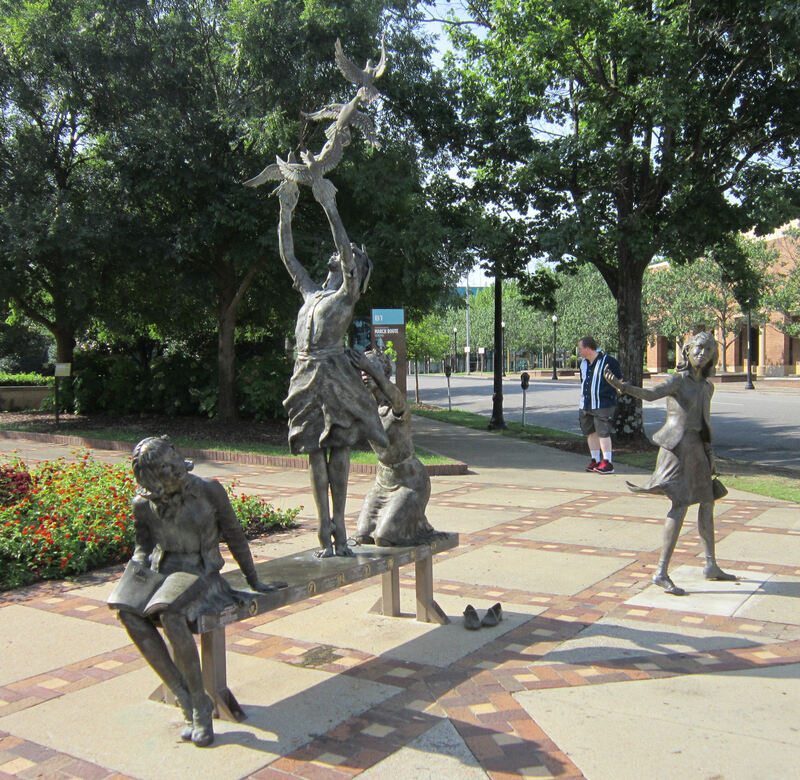 This bronze/steel sculpture by Alabama native Elizabeth MacQueen captures the essence of the four girls that morning before man’s cruelty tried to write them off as acceptable losses, disposable bodies, flitting insects who dared invite their malignant wrath. 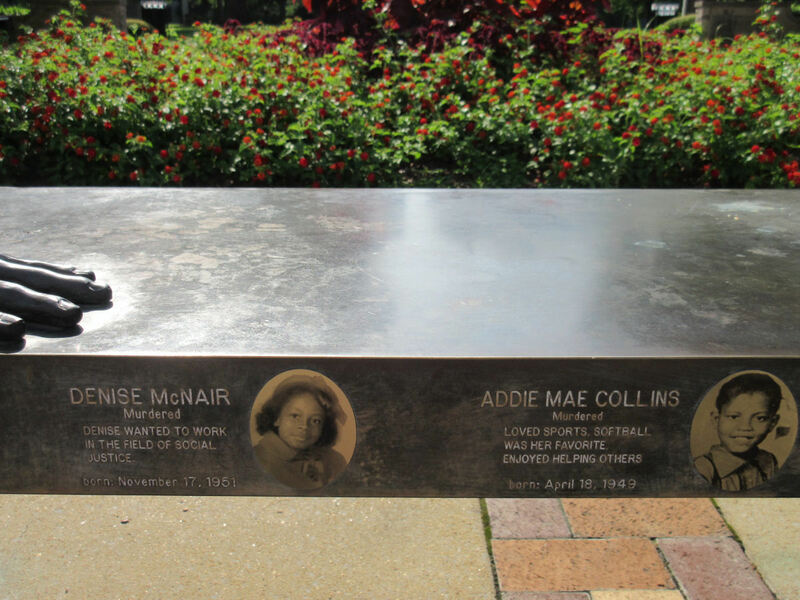 On the front of the bench are plaques remembering the lives and the qualities that made those four girls, two other young men who died in town later that day for committing the same crime of Breathing While Black, and Addie Mae’s sister Sarah, who survived the explosion with twenty-one shards of unforgiving glass stuck in her face and one eye forever lost. My wife and I arrived before morning services started. She exchanged a few friendly words with another family of tourists on their way inside. She and I had discussed the possibility of worshiping there that morning, but I was loath to intrude and we hadn’t brought proper clothing for the occasion. Maybe that sort of thing wouldn’t have mattered to anyone but us, or maybe it would’ve. Either way, some combination of humility and reverence made me feel too self-conscious about walking inside as a distracting outsider with a camera in his pocket. We were elated to return and reconnect with our home church the following Sunday. 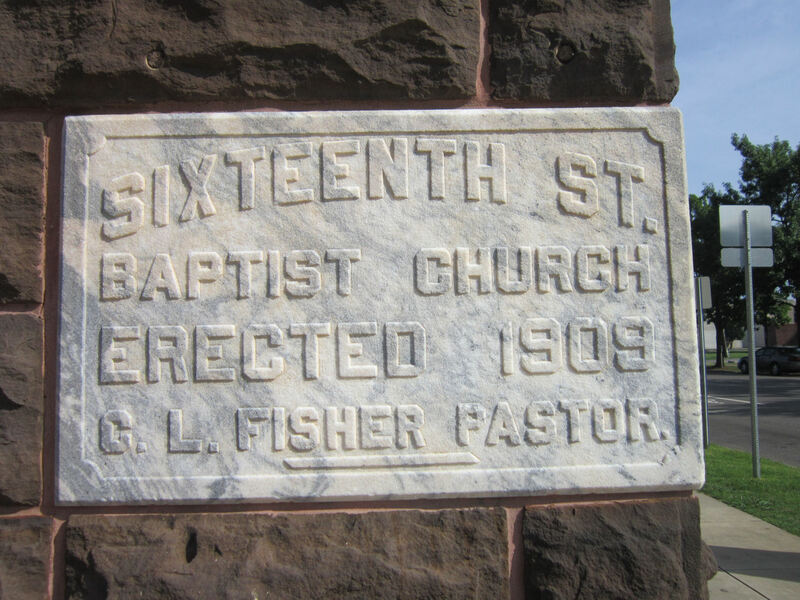 For this Sunday, we settled for time spent in the presence of God’s house on Sixteenth Street — a place of tragedy, renewal, remembrance, hope, and faith. 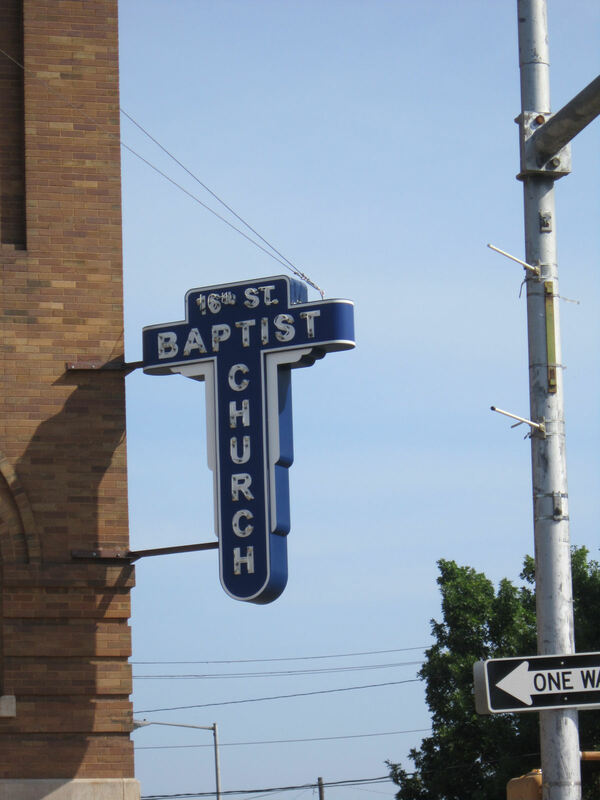 Maybe it wasn’t all these things to everyone who’d ever been on that corner, but the church stands willing and ready to serve those who’ve come ever since. May they never have to travel all the same footsteps. 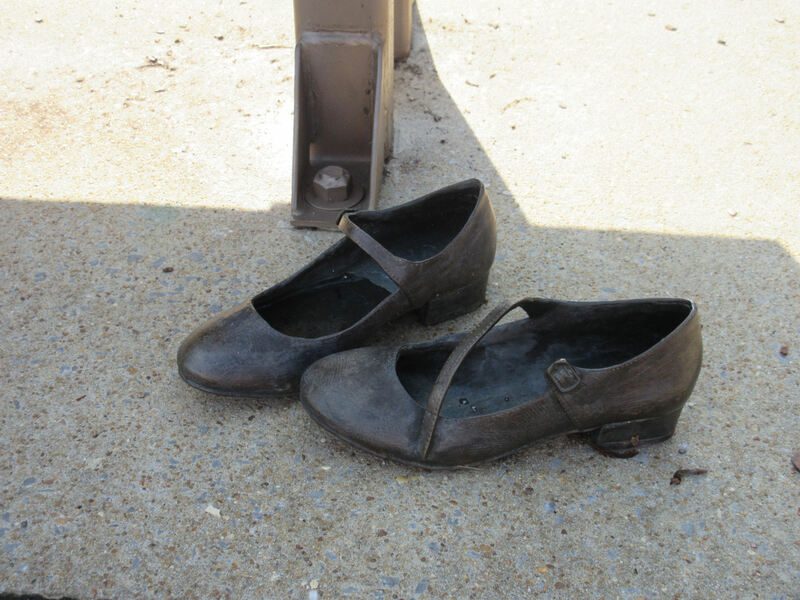 In bronze: girl’s shoes, worn nevermore. Thank you for this excellent, excellent post. It’s so heartfelt I have tears in my eyes. Btw, “down-home white terrorism” is a well put phrase and….yup. I appreciate the kinds words. This took me a couple of days to collect myself and do it justice. And as for that phrase, there really was no other way to label that kind of monstrosity. I’ll never understand how any of them could’ve stood to see themselves in a mirror for the rest of their wasted lives.